The researchers, together with scientists at the University of Alabama at Birmingham School of Medicine, discovered that a common symptom of Alzheimer's disease - the accumulation of amyloid plaques along blood vessels - could be disrupting blood flow in the brain. The results were published Monday in the journal Brain. "We've always been interested in how glial cells interact with blood vessels," said Harald Sontheimer, director of the Center for Glial Biology in Health, Disease, and Cancer at the Virginia Tech Carilion Research Institute and senior author of the paper. "Astrocytes are the most populous cell type in the brain and even outnumber neurons." Sontheimer also noted the importance of astrocyte function in the brain. "Astrocytes serve many support functions, such as shuttling nutrients from blood vessels to nerve cells or removing their waste products," said Sontheimer, who is also the I. D. Wilson Chair in Virginia Tech's College of Science. "They also control the diameter of blood vessels to assure proper nutrient and oxygen delivery to the brain and maintenance of the blood-brain barrier. In response to injury and disease, however, astrocytes become reactive and change many of their supportive properties." Sontheimer's team discovered that the astrocytes' blood flow regulation is disrupted by plaques formed of misfolded amyloid protein around blood vessels. In a healthy brain, amyloid protein fragments are routinely broken down and eliminated. 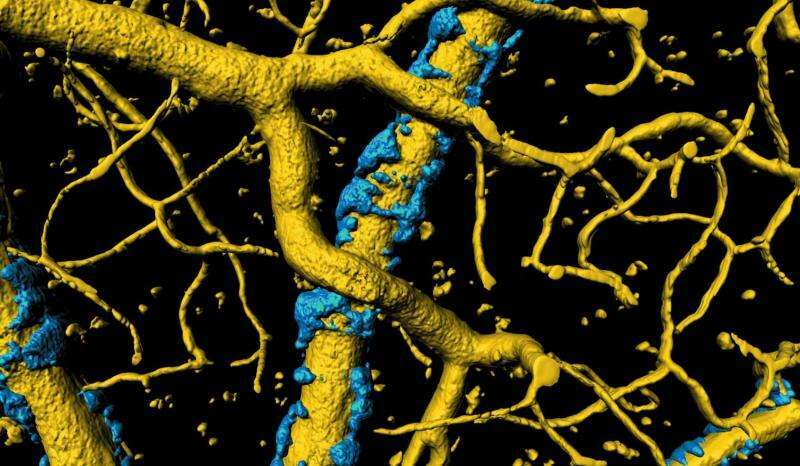 The presence of amyloid proteins around blood vessels in the brain is a hallmark of Alzheimer's disease, yet it wasn't understood if the proteins did any harm. Now, Sontheimer's team has found that they do. "We found that amyloid deposits separated astrocytes from the blood vessel wall," said Stefanie Robel, a research assistant professor at the Virginia Tech Carilion Research Institute and a coauthor of the paper. "We also found that these amyloid deposits form an exoskeleton around the blood vessels, a kind of cast that reduces the pliability of the vessels." The exoskeleton is known as a vascular amyloid. Its inelasticity might result in lower blood flow, which could account for Alzheimer's symptoms, such as memory lapses, impaired decision-making, and personality changes. "Vascular amyloid may be the culprit in Alzheimer's disease symptoms, especially considering that the amyloid exoskeleton might limit the supply of oxygen and glucose to the brain regions that need them most," Sontheimer said. "This could also explain the cognitive decline in people with Alzheimer's disease, as the disease is associated with reduced cerebral blood flow." While the scientists don't fully understand the role of vascular amyloid in Alzheimer's disease, they now have a possible therapeutic target to study. "It may be helpful to remove the deposits to allow for appropriate blood flow," Robel said. "The problem is we don't know. It might be harmful to remove vascular amyloid at late stages of the disease; maybe they're actually holding the vessels together." The researchers' next step will be to examine blood vessels once the amyloid deposits are removed. "Vascular amyloid is strangling the blood vessels," Sontheimer said. "By removing them, maybe we'll be able to restore blood flow regulation. Perhaps it'll turn out vascular amyloid is preventing further degeneration. Whatever the case, we'll certainly learn something new."